Ich bin ein Imker aus Rotterdam und neulich hat mir ein Imker-college gefragt ob ich mich auch beteiligen moechte an ein varroa bekampfungs-experiment mittels ein natuerlichen Feind der Milben. In diesem Falle handelt es sich um den zgn Pseudoscorpion. Der Leiter des Exeriments zuchtet selber zuhause seit 3 jahren diese Tierchen. Schon viele Hollaendischer Imker haben sich vorgenommen sich am Experiment zu beteiligen. Im Thema sind wir angelaggt beim ein deutscher Forser, Alois Alfonsus, der in 1891 in einer Deutschen Imkerzeitschrift etwas bubliciert haben soll ueber "Chelifer Cancroides", eine art Pseudoscorpion. Hat einer von euch von ihm und sein Werk gehoert? Wer hat vieleicht weitere information mit bezug zu Pseudoscorionen als natuerlichen Feind des Varroa Milbens ? Sollte damit der Bücherskorpion gemeint sein? Indertat, Lothar, der Buecherscorpion is auch einer der Pseudoscorpionen. Ob dieser sorte bei dem experiment benutz wird weiss ich nicht. leider kann ich deine Frage nicht beantworten. Aber sie berührt ein Thema, das bisher, so glaube ich, zu wenig diskutiert worden ist: Jedes Tier hat seinen Fressfeind und seine Krankheit. Das muß doch auch für die Varroa gelten, oder? Pheromonfallen für Traubenwickler, ein Bakterium gegen die Stechmückenlarven im Wasser, Wanderfalken gegen Taubenplagen in den Innenstätten ... man könnte die Reihe beliebig verlängern. Nur die Varroa strotzt nur so vor Gesundheit und Vitalität. "Nur die Varroa strotzt nur so vor Gesundheit und Vitalität"
Kann sein, das wir bei der Bekämpfung nur die alten, kranken und schwachen erwischen; und die gesunden leben lassen. Aber der Einsatz von Fressfeinden oder Krankheiten gegen die Varroamilbe hat was für sich. da wäre ich aber vorsichtig, veremeintliche freßfeinde von/für schädlinge zu suchen. klar, einen erfolg, z.b. die varroa zu beseitigen, kann es bringen aber kann ein (ausgesetzter) schädling nicht auch andere schädigungen des labilen ökosystems hervorrufen? m.e. kann eine verantwortungsvolle schädlingsbekämpfung nur regional und nicht global durchgeführt werden, denn was nützt uns der natürliche freßfeind der varroa aus fern-ost, wenn der in deutschland nützliche insekten schädigt, in kälteren regionen sich aber gar nicht entwickelt? ich denke, daß man da genau so sensibel laborieren sollte wie mit der diskussion um gen-getreide! ein anderer weg der varroa-toleranz scheint mir z.zt. wirklich nur über die zucht zu gehen. ich jedenfalls finde es einleuchtend, kleinere bienen zu züchten und damit der varroa das schädigungspotential im bien zu nehmen. 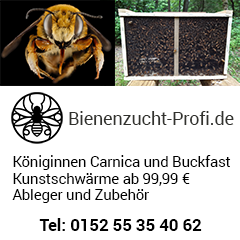 (kleine bienen, kleinere waben, weniger platz für varroen, kürzere entwicklungszeit der bienen, kürzere entwicklungsmöglichkeit für varroen). zu klären wäre, ob sich an die neuen gegebenheiten die varroa anpassen kann, denn es ist ja zu lesen, daß es nicht zu genetischen deformationen komme, obwohl es sich um eine geschwisterpaarung handele. - ob ein so hoch spezialisiertes wesen sich innerhalb von 1 saison an neue gegebenheiten anpassen kann und sich weiter vermehren kann? Could Pseudoscorpions from South African beehives control our varroa? Sometime last year Mr Mark Hale, a South African beekeeper, posted a message on Bee-L (an international computer mailing list with nearly 1000 subscribers), in which he said that when their hives contained several dozen pseudoscorpions, Varroa mites were causing no problems. Varroa was first recorded in South Africa in 1997, and where pseudoscorpions are present in good numbers, control measures are not necessary. My immediate reaction was that researchers would leap to investigate this story, because if pseudoscorpions were indeed controlling Varroa, perhaps they could be introduced to hives in other countries? I saw no further messages on Bee-L, but immediately Varroa was confirmed present in New Zealand on 11 April, I posted a message asking for contact from researchers who may be working on South African pseudoscorpions. Mark Hale replied saying to my surprise that I was the only person who had responded to him. As far as he knew, no researcher had investigated or was investigating the phenomenon. He said other beekeepers had reported that they too had witnessed the invasion of hives by Varroa, followed by an increase in pseudoscorpions and a virtual disappearance of Varroa. Mark forwarded to me a report of such an experience written by Mr Eddy Lear and published in the April 2000 issue of 'Southern Beekeeping Newsletter'. Since then I have endeavoured to obtain as much published information as possible, and have made every effort to locate researchers who may be able to pass on first-hand information. Pseudoscorpions are small spider-like creatures with a pair of scorpion-like nippers, but no stinging tail. They are about 2-6 mm long, there are thousands of species in the world, and New Zealand has at least 70 species. The usual habitat is decaying plant material where the prey are all kinds of little creepy creatures such as insect larvae, springtails and mites. Nowhere in the world do pseudoscorpions cause problems to people. Pseudoscorpions are not closely related to real scorpions and are called 'pseudo-' (meaning 'false') -scorpions because of their superficial resemblance to real scorpions. Several species of pseudoscorpions have been recorded in hives in Europe and North America, and one of these, Chelifer cancroides, does occur in New Zealand, but from bird nests. There are no suggestions that in Europe this pseudoscorpion eats Varroa, but, interestingly, some reports dating from around the 1920s speculated that perhaps it ate acarine mites. I have been unable to find anything more about this speculation. At least two other species of pseudoscorpions were recorded from South African beehives around the turn of the century. One of these, Ellingsenius sculpturatus (Fig 1), is widespread in southern Africa, and appears to live right among the bees as it travels with them in swarms by clinging onto hairs etc. Mark Hale has also seen the pseudoscorpions living among the bees in hives with the bees ignoring them. A study was started about 80 years ago, but was abandoned by 1922 owing to pressure of other duties (Whyte 1922) and nothing more was published. Since then, as far as Mark and I have been able to determine, there has been no research. A second species, E. fulleri, was originally named from Cape Province, and more recently has occurred in Spain, Mozambique, Cyprus and Iran, but there are no further data and I know of no reports from these areas of Varroa being controlled by pseudoscorpions. pseudoscorpions and Varroa. It is clear that the recognition of the presence of Varroa and the reports from beekeepers have been so recent that no researchers have yet 'geared up' to investigate the reality of the situation. However the information does suggest that at least one species of pseudoscorpion is living in beehives there, where historically it has preyed upon small creatures such as several species of mites, and small larvae of wax moths, flies and beetles. When Varroa invaded South African beehives, it appears that to pseudoscorpions this mite became just another food source. So the position is that we have substantial reports from South African beekeepers that pseudoscorpions are eating and controlling Varroa so well that no measures are used against them, but little is known about the pseudoscorpions, and there are no scientific studies yet underway. On 4 May I wrote to the Minister of Agriculture asking if he wanted me to pursue this possibility for Varroa control. On 8 May his Private Secretary replied saying that the matter fell within the portfolio of the Minister for Biosecurity, so my letter was being referred to the Hon Marian Hobbs. There has not yet been a response. If we are to discover whether South African pseudoscorpions are actually controlling Varroa, the most expeditious way to do this is to send a researcher over from here. While awaiting a response from the Hon Marian Hobbs, with the support of the National Beekeepers Association of New Zealand and a beekeepers' 'farmer group' I have applied for funding from Agmardt to spend a couple of weeks in South Africa to obtain on-the-spot data. If indeed Varroa are being eaten and there appears to be no harm to honey bees, the next step would be to consider applying to ERMA (the Environmental Risk Management Authority) for permission to import pseudoscorpions to quarantine here at Lincoln for further study. Their life cycle would have to be elucidated, and also their interaction with our honey-bee genotypes which of course differ from those in South Africa. If all appeared to be the way we wanted it, and permission was obtained for field release, the next step would be to inoculate pseudoscorpions into hives in the field. A pseudoscorpion breeding facility could be established to make them available to all comers as soon as possible. If all went well our Varroa would be controlled biologically and without chemicals, and at no further cost. Because pseudo-scorpions ride on bees, they would spread from hive to hive, so even feral colonies in remote areas would ultimately have them. A full scale Research Programme, as outlined here, could be run at different levels, but a couple of hundred thousand dollars each year for several years would probably be sufficient to run the Programme at a level that should see substantial results in a few years. If a decision is made not to attempt eradication of Varroa, or even if eradication is attempted and fails, control using Apistan and perhaps other methods will have to be initiated. As pseudoscorpions became available, chemical control could be phased out. If pseudoscorpions didn't work as hoped, chemical control would continue until other Varroa control methods were developed. Under this scenario, the cost is minimal compared to spending $55 million on an eradication attempt that in the opinion of many will fail. Also no hives need be killed, and if all goes well, eventually we will revert to chemical-free beekeeping. If pseudoscorpions prove to have no promise, all we will have lost is $10-15,000. A word of caution: a pseudoscorpion of a different species that lives in bee colonies in the Belgian Congo was seen to apparently cause the death of a bee when the two were confined in a container (Vachon 1954). The author emphasised that the situation was artificial, but the observation points out the need to ascertain exactly how pseudoscorpions will interact with our bees before field release is contemplated. Mark Hale has been unstinting with his help, and has provided most of the recent information on pseudoscorpions in South Africa. Hewitt, J. and Godfrey, R. 1929: South African pseudoscorpions of the genus Chelifer Geoffroy. Annals of the Natal Museum 6, 2: 305-336 + 12 plates. Lear, E. 2000: Some recent beekeeping observations. Southern Beekeeping Newsletter 2/00: 1 -4. Vachon, M. 1954: Remarques sur un pseudoscorpion vivant dans les ruches d'abeille au Congo Beige Ellingsenius hendrickxi n. sp. Annales du Musee Royal du Congo Beige Tervuren 1: 284-287. Whyte, R. 1922: The false scorpion. The Bee World July: 37. The pseudoscorpion Ellingsenius sculpturatus from a South African beehive (length about 6.5 mm) (from Hewitt and Godfrey, 1929). das klingt ja sehr spannend!! Wenn Du mehr aus Neuseeland hörst, wäre es schön, wenn Du es weiterhin hier posten könntest. Thomas Kober hatte im letzten Jahr die These von bisher nicht bekannten oder beachteten "Drittorgansimen" als einem von mehreren Faktoren der Varroaresistenz in die Diskussion gebracht. Man müßte sich fragen, inwieweit solche Drittorganismen wie dieser Pseudoskorpion möglicherweise die stellenweise hohe Varroatoleranz bzw. -resistenz mancher afrikanischer Bienenrassen mitbedingen. - Die Attraktivität der Brut für die Milbe ist rasseabhängig verschieden und bei den AHB wesentlich geringer. deine Beitrage ist ebenso interessant ! Wie ich im ersten Stück schrieb bin ich u.a. auf der Suche nach Forschungswerk des Deutschen Alois Alfonsus. „Nur die Varroa strotzt nur so vor Gesundheit und Vitalität“. 25 Jahre Varroaselektion haben eben nur die vitalsten Tiere davon überleben lassen. eigentlich habe ich Christoph zitiert, aber das ist eher nebensächlich. Es stimmt schon, wir haben Zucht und Auslese bei der Varroa betrieben. Darüber haben wir hier schon einmal eine lange Debatte geführt. PS. Wer kann den Beitrag über Neuseeland übersetzen? Ich dachte, ich bin der einzige in diesem Forum, der keine Weltsprache beherscht. 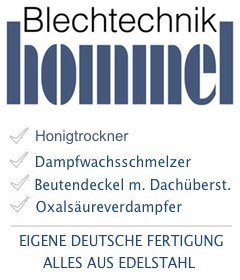 Kein Englisch oder Französisch, aber dafür kann ich "Elektrisch"
ich habs mir ausgedruckt und geb mich dran. Für euch tu ich ja (fast) alles..
Hier einstellen oder per PN? Mir scheint hier wird schon wieder eine Sau durchs Dorf getrieben. Ich glaube bei Th.Ko. las ich mal die sinngemäße Formulierung, Varroaresistenz sei „ein balanciertes Gleichgewicht“.